A young boy sneaks onto his grandfather's hot air balloon and together they travel over France. In the Camargue, France, a young boy bonds with a white haired horse that escaped from ranchers. A little boy and his baby-sitter inhabit the same imaginary world: through their adventures they are followed by a strange red balloon. Up ,up and away in my beautiful balloon! Albert Lamorisse was a specialist of works aimed at the children's market;his first movies were shorts :'Bim" (a collaboration with Prévert),"Crin blanc" generally considered his towering achievement,and "Le Ballon Rouge"which is much more popular abroad than in France (although the story was in many textbooks in the early sixties). "Le Voyage En Ballon ",although Pascal ,its young hero ,was taken away for a journey around the world by balloons,is not really a sequel. Much more modest in scope,it's the story of an old scientist and his grandson (the little star of his precedent short) who travel all above France , from north to south in a balloon.It was a technical tour De force ,for it was filmed in "Helivision" movie camera on a helicopter,a technique which was reportedly used later in the James Bond saga.No optical effects,quite a feat! The budget was certainly rather comfortable at a time when color and wide screen were not that common in France ;the cinematography is of course splendid and the score is up to scratch .The best scene is perhaps that of the stag ,pursued by hunters with hounds ,which is saved by the aeronauts;there are nice shots of Notre Dame De Paris and of the Château De Chenonceaux ("is it a bridge or a castle? );on the other hand,the scenes where old scientists appear and claim that the balloon is in jeopardy get in the way.Like the stodgy long professor's lecture at the beginning ,it's mostly filler. 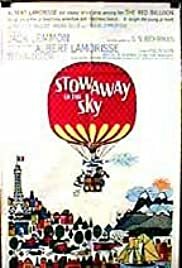 This is the main problem which wasn't in any way apparent in 1960,when most of the French would not go by plane,let alone by balloon;as Lamorisse 's first efforts were shorts,they were not boring in the long run;this 80 min work is monotonous in the end and it's dubious it may appeal to today's brats as it did half a century ago.It does not possess the poetry of "Crin Blanc " and "Le Ballon rouge " ,which still fascinates today.Compare the endings of this movie and that of the wild horse,both taking place by the sea. That said ,"Le Voyage En Ballon" might possess considerable appeal for grown-ups who have kept their child's soul. Lamorisse died in an accident in 1970,age 58, during a shooting in Iran.